FOR IMMEDIATE RELEASE: Lewiston, Maine (September 5, 2016) – Taylor Trahan is a statistical oddity. A native of Littleton, New Hampshire, now living in East Concord, Vermont, the 25-year-old pursued mixed martial arts seven years ago, soon as he was legally old enough to do so. He has entered the cage a total of 20 times in professional and amateur competition. 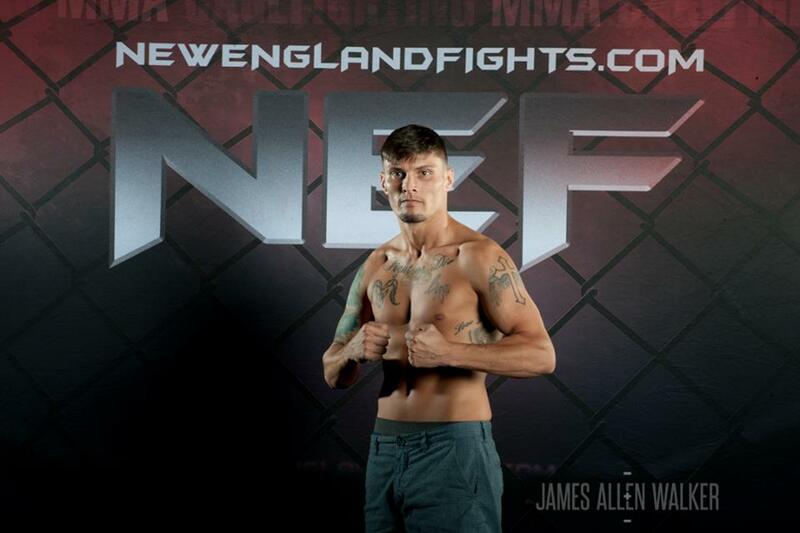 All that experience in this neck of the woods, yet his featherweight bout against Matt Denning at “NEF 25: Heroes and Villains” on Saturday, Sept. 10 at Androscoggin Bank Colisee will be his debut with New England Fights. Trahan (5-6) is not buying the underdog or bad-guy label, even though he will walk into the historic arena in a city that Denning (3-3) calls home. Both fighters hope the matchup will reverse their recent career fortunes. Trahan has lost five consecutive fights since a red-hot start to his pro docket, while Denning has dropped three of his last four contests. Denning is quick to point out that the results are deceiving on both sides. If anyone has the right to consider himself an expert in ranking those middle weight classes, it’s Denning. The local favorite known as “Ken Doll” has never shied away from fighting the best that NEF has to offer fighters in the neighborhood of 145. Denning twice defeated Derek Shorey. He inched upward in weight, unsuccessfully, against Jon Lemke at 150 and Josh Harvey at 155. Most recently, Brandon Bushaw beat him by submission at “NEF 24: Promised Land” in June. Jiu-jitsu is the go-to for both fighters. Trahan is a brown belt, while Denning is a purple belt. In other areas, their styles clash. Three of Trahan’s pro wins have come by decision. Denning, meanwhile, has never gone the distance as a pro. He only went to the cards once as an amateur – a loss to Dom Cofone in his cage debut. Trahan stopped short of a prediction but said that he expects to prevail by submission. Denning has prepared for a lengthy encounter. He confessed that he smoked through most of his career but has quit. Couple that with a renewed commitment to road work and Denning forecasts that his fans will be pleased with his readiness for the relatively unknown foe. He said that sparring against Erickson has prepared him for the taller Trahan. Denning believes that his striking and wrestling are superior to Trahan’s repertoire, but he complemented his rival by adding that he considers him another in a line of rugged opponents. Given the unpredictable nature of MMA, pro fighters must have short memories while applying the hard lessons they learn from losses. Trahan, like Denning, thinks he has achieved that. The opening bell this Saturday, September 10 is set for 7 p.m. The current docket for “NEF 25: Heroes and Villains” includes three professional boxing matches, five pro mixed martial arts bouts and five amateur MMA scraps. Tickets start at $25 and are available at www.TheColisee.com or by calling the Colisee box office at 207.783.2009, extension 525.